A blogging friend, Calmgrove, commented on my previous post, saying how strange it is that in modern times, despite an abundance of comediennes, there are no female tricksters. Then it struck me – and it’s so obvious, I can’t believe I didn’t think of this earlier. In an era when tricksters come to us on screens rather than stories told around a campfire, we cannot forget Lucille Ball’s role in “I Love Lucy.” The show ran from 1951 to 1957 and was the most watched the American television program during four of those six seasons. It is still in syndication in dozens of countries around the world. 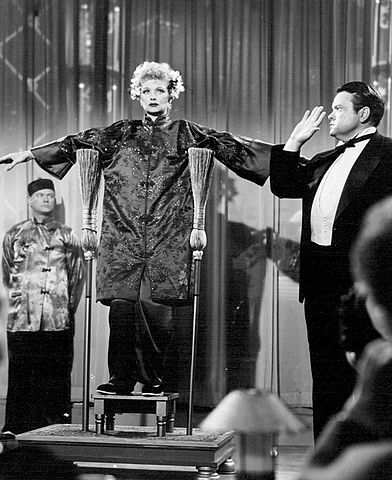 Lucille Ball and Orson Welles.From a 1956 episode. Public domain. Lucille Ball, with her clowning and physical comedy, set a tone that is still at the core of many sitcoms. Most of the best known women comics who followed cite her as a groundbreaker, an inspiration, a mentor, and often a friend. In terms of our “classic trickster” test, that is what she was, at all times. Never just a funny housewife, Lucy was an outrageous but charming disrupter, whose pioneering humor enlivened the spirits of millions who watched her. I dare you to get through the chocolate factory scene with a straight face. Quite a few full episodes of the show are available on YouTube. This entry was posted in Culture, humor, Television and tagged Culture, humor, I Love Lucy, Lucille Ball, postaweek2014, trickster, Tricksters, TV. Bookmark the permalink. Brilliant, whilst writing on the tricksters iv not made this conection before. Nice concept. A recent comment here sparked that connection, which to my mind, is the blogging community at its best!